Since the age of 16, Jessica has been leading various fitness classes and group exercise formats. Her passion is to make exercise fun and accessible to anyone and everyone who wishes to better their health and life. Her classes incorporate effective functional exercises to improve balance, coordination, muscular strength, and mobility. Years of passion and experience in the world of physical fitness and athleticism naturally led Couron to love his work as a fitness instructor. 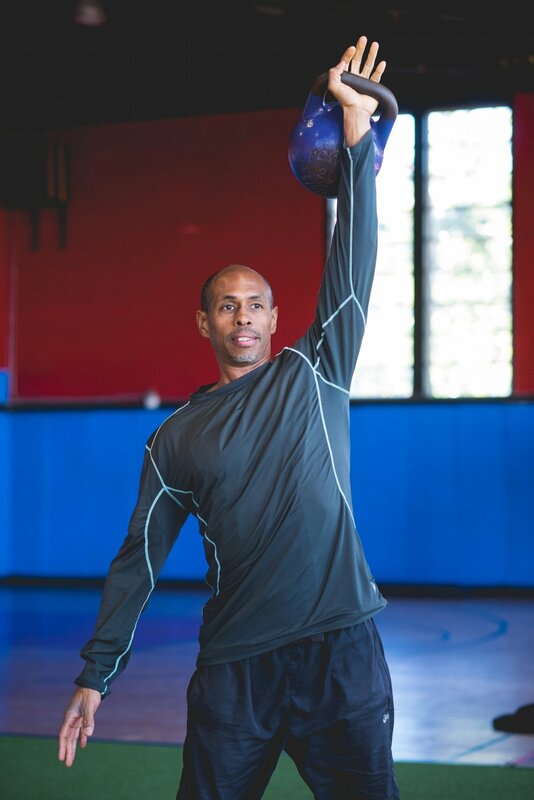 Certified by the National Academy of Sports Medicine and always a continuing student, Couron combines cutting edge techniques with tried-and-true traditions to help get his participants strong, fit, flexible and healthy. Through positive and humorous energy, Couron keeps his classes enjoyable and effective. Over the past decade, Miles has worked with everyone from professional and Olympic athletes to senior citizens coming in for their first workout. Miles has the experience to help you reach all of your goals and help you be the best that you can be. His goal is to get you looking great, feeling great, and being great; improving your physical, mental and spiritual health so that you may share it with everyone in your life. Jerome has over 20 of experience in yoga, yoga therapy, meditation, chi gong, NLP, clinical hypnotherapy, mindfulness training, fitness strength and conditioning and coaching sprinters and distance runners. He literally teaches everything from athletic bootcamp to restorative yoga! Join Jerome for an energizing and uplifting group fitness experience. As a division 1 athlete Jenna mostly trained in strength and agility. Her focus was training young children and teens for conditioning at a collegiate level for several years. She brings the same enthusiasm to all of her classes. Her workouts will challenge and energize you to keep pushing till you reach your goal. Jenna's passion is to inspire people to reach their health goals through fitness. Getting mentally and physically stronger each time they leave the gym, and discover they can have fun doing it. After ten years of gymnastics, acrobatics and dance, Nina became a personal trainer as well as youth and group fitness instructor through NASM in 2013. Since then she's been working in the field of health and fitness and helping countless people reach their goals through highly efficient workouts. She loves teaching classes that require high energy and loud music, and her positive and genuine personality will leave you feeling warm and welcome. As a current dancer in house and techno, as well as brazilien samba, she absolutely loves feeding off of fast beats and will make you forget you are working out! Join her workouts and watch yourself transform! Shaily has been teaching Les Mills BodyPump for 3 years and is certified in various other Les Mills formats. She brings a unique fun energy to her classes and is passionate about fitness, sports and anything active! Shaily's friendly bubbly energy will make the workout go by fast, keeping each minute enjoyable and effective! After competing as a top pole vaulter at USC and spending almost two decades in the gym, Derek developed a deep intuition for health & fitness. He is compelled to share his passion and help others reach their personal health & fitness goals. Whether the goal is to lose fat, add muscle, or simply to feel good, Derek has the knowledge and experience it takes to produce changes and see results. His philosophy is that every human has the potential to achieve their own version of greatness, and that greatness begins within the body. Your relationship with your body affects your senses and perceptions of the world – shaping thoughts and feelings on a moment-to-moment basis. Derek's classes are fun, result driven, and enjoyable from start to finish. Jerome started taking fitness classes after a volleyball accident shattered his knee in college. After the surgery, he was on crutches for about 3 months and made it to a whopping 280lbs! Physical therapists and doctors recommended water aerobics to ease back into a healthy lifestyle. After taking a few classes in the water, he ventured to land in a Turbo Kick class. Fast forward 13 years, Turbo Kick was Jerome's first fitness certification of 35 to date. You can find Jerome teaching various class formats (he can't sit still) that include Pilates, Strength, Cardio and HIIT with a hospitable attitude that stands out. On the weekends, he is a skilled Barista and Supervisor at Starbucks. The Finest Functional Training Facility in San Diego!